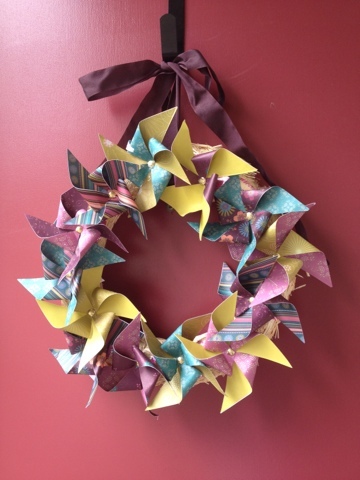 Today's "Make It" item was a colorful Pinwheel Wreath for our front door. Honestly, a new door decoration was needed since my Easter wreath was still hanging up. It was very user friendly with photos for most every step. The tutorial called for a foam wreath and I had a straw one on hand so, I used that. It worked fine but I think a foam one would be better as it is a little thinner and the pins would stick in better. I did find this craft a bit more labor then I anticipated. However, the finished product is well worth the time & effort. Mother Nature will have the final say as to if this will weather the outdoors.